PlayOJO is a unique casino that launched in 2017, so it’s a fairly new destination on the market. They are being operated by SkillOnNet Limited and are being regulated by the Malta Gaming Authority, as well as the UK Gambling Commission. This means that they are offering SkillOnNet games to their players, but they also have other software providers delivering games to their platform. 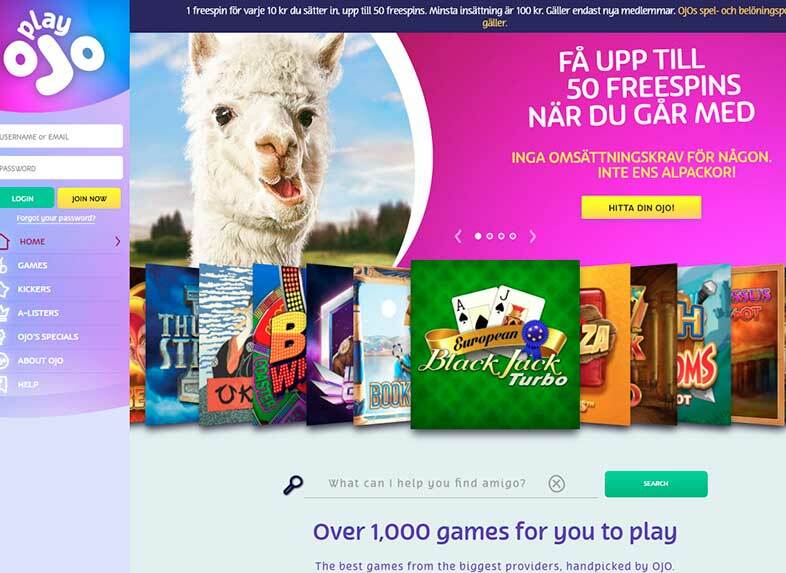 Some of these providers are Yggdrasil Gaming, NetEnt and Blueprint Gaming. When it comes to their website, it looks both bright and colourful, and you can see it has a modern design. You can easily navigate in the casino from the front page because you get a lot of information right away. For example, you can see some of their games, the place to contact them, the option to change the language, where to sign up and more. In PlayOJO Casino you can use several payment options to make deposits and withdrawals, and all of them are very common in the industry. Customer service is not available around the clock, but it’s possible to send them an email at any time. Live chat can be reached from 06:00 to 00:00 GMT. As a new player in a casino, you often expect to get a welcome bonus that you can use to play with more money, be entertained for a longer period of time and hopefully meet the wagering requirement. The thing is that PlayOJO Casino has chosen to do things a lot differently. They don’t really have the most common welcome package and promotions, because there are no wagering requirements attached to any of them. All of this might sound very strange because it’s very normal that a casino has wagering requirements players have to meet. It’s also normal to get a match deposit bonus, but PlayOJO has decided to only reward players for playing in their casino instead. Even though these rewards might not be huge, it’s still a lot better than not completing a wagering requirement which means you would go home with nothing. When it comes to PlayOJO’s welcome package, you will get 1 free spin for every single euro that you deposit. You can get a maximum of 50 extra spins+30 exclusive extra spins from us, which means you will get the maximum benefit of the package if you deposit €50. PlayOJO wants you to know that they don’t have any hidden terms or any wagering requirements attached. They only expect you to follow OJO’s Reward and Game Play Policy. It’s very straightforward, so there shouldn’t be any misunderstandings while you bet with OJO’s Welcome Play Package. Currently, PlayOJO casino doesn’t offer any kind of no deposit promo codes. But like we mentioned before you can get up to 50 extra spins with no wager at all. You can even make a minimum deposit and activate it to boost your winnings. If you are looking for no deposit offers, you can get free spins no deposit bonus at our special section. However, they all come with wagering requirements. All players that love gambling on a mobile platform will be happy to hear that PlayOJO Casino has optimized theirs for such use. This means that you can play a great number of mobile games on the go or play them at home. If you search for them on your mobile, you will see that the design is great and that it’s user-friendly, just like the website is when you are on a computer. As we talked a little bit about earlier, you will be able to use the most common payment methods that are being used in the industry. These payment methods are Trustly, Paysafecard, Visa, MasterCard, Skrill, Neteller and PayPal, which is awesome. Not all casinos offer PayPal, so we think that those that prefer using this payment provider will be very happy that it’s available at PlayOJO. When it comes to limits per transaction, you can expect a maximum of €10,000. The good thing about this is that it’s not €10,000 per week or month. When it comes to the pending time after making a withdrawal you can expect anything from one to five days, which is a bit high if you have to wait longer than 24 hours. On the bright side, it doesn’t take more than a day to get paid via e-wallets. If you need any help as a user at PlayOJO Casino, you will be able to contact their customer service. You can do this either by email or by live chat. If you haven’t signed up, you will have to use the email option, but as a player, you can use both. Live chat is available from 06:00 to 00:00 GMT, which means they are available during most of the day. In the casino, you can play games from software providers like Microgaming, Merkur Gaming, NetEnt, Yggdrasil Gaming, Blueprint Gaming, Big Time Gaming, Scientific Games, Bally Technologies and more. Some of the games you can expect to play at PlayOJO Casino are Joan of Arc, Vikings go Berzerk, Guardians of the Monastery, Cash of Kingdoms, Reactoonz, Immortal Romance and many more. They actually have over 1000 titles in their game library. Activate Your Sign-Up Bonus Now! As we talked about earlier all new players are welcome to use PlayOJO’s welcome package. Here you will be able to get up to 50 free spins if you deposit €50, but this doesn’t mean that you have to deposit the maximum amount. There are also other promotions that you can use as a player, and by checking their site, you will be able to see some of them. Another awesome thing about PlayOJO is that there are no wagering requirements attached to either promotions or the welcome package. Some casinos have wagered on deposits, even though it’s not very normal, but at least it’s nothing you have to worry about here! PlayOJO is a unique casino that doesn't have a typical welcome bonus, but instead an innovative welcome package. There are no wagering requirements that need to be met, which is awesome. You can get up to 50 free spins free by depositing €50, there are also other goodies that you probably will like in the casino. They have over a thousand games from a good number of providers, and they have a live chat option for you to contact them.